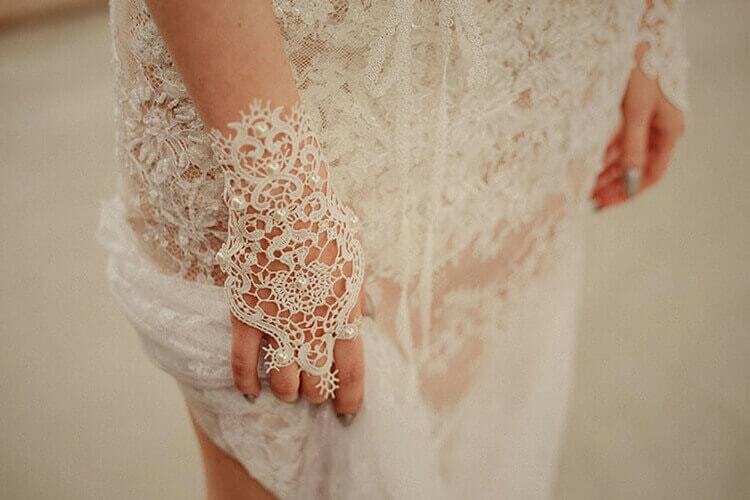 Most beautiful wedding dresses made of laces. Get yours in one day! Looking for wedding dress of your deams? You’ve found the right place! TheBohoDresses is a Wedding Dresses Atelier where you can have your custom-made wedding dress in one day! Designer, stylist. She creates clothes for women who expect something different, unique. She designs custom-made wedding dresses, evening dresses, dresses for special orders. See her the most beautiful projects. Here are unique wedding dresses. They are exceptional, like all of us, unique – wedding dresses designed and custom-made. 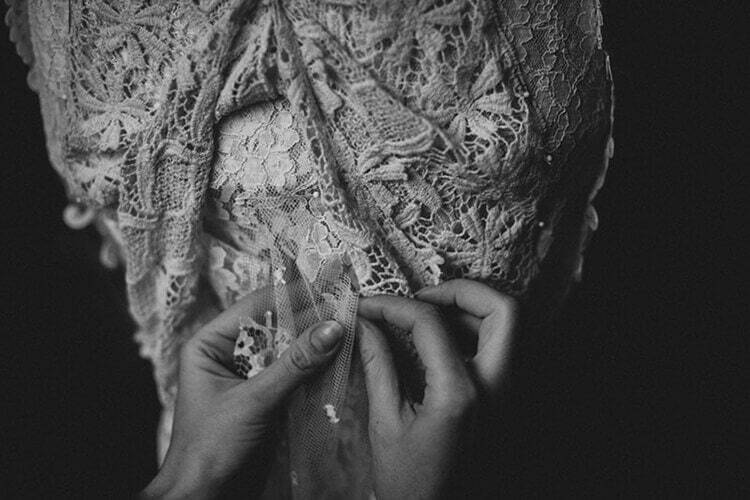 I put all my heart in the sewing of wedding dresses. A wedding dress must reflect a woman’s character, features and needs. The only limitation is imagination. I sew wedding dresses together with clients and that’s why each dress is unique. I capture wedding dresses on myself to show you how variable a woman can be, how different wedding dresses can be – short, lace, boho, classic. The latest collections of wedding dresses! Almost all wedding dresses can be freely modified, so that each lady can choose her favorite model and together with me create an ideally fitted dress for herself, for the wedding circumstances. I have created collections to make it even easier to choose your dream wedding dress. See the catalogue, choose a ready-made model for you or compose your wedding dress from the available parts. I invite you to my studio where I will sew your dress in one day! When I started sewing wedding dresses I didn’t think that I’d get to know so many amazing women in my life! So many interesting stories. That the one-day process of sewing a wedding dress can end in friendship! That in such a short time you can get to know someone so well and learn so much from them! It is a gallery of angels, which stood on my professional path, with whom we provided each other with so much emotion. See my Brides and their wedding dresses. Welcome to the world of feminine, delicate, lace wedding dresses. Designed with passion and attention to detail so that you feel exceptional and beautiful in this most important day! Princess dress? Not for me! I’ve never been a fan of weddings or wedding dresses until Boho has crept into my world. Recent wedding trends revolved around snowy white, large pits, stiff and shiny fabrics. Everything tuned and rich but…. where is the bride in all this? And what are the women who have always been closer to the pirate or Anne of Green Gables than to the princess from Disney’s fairy tales supposed to conceive? And when many of these women lost hope that on the wedding day her body would be surrounded by a light wedding dress instead of tulle beige, boho style entered the salons. Together with it, I entered the Polish market shyly, offering women a total change in the image of the bride. Wedding dresses – is it a destiny? For as long as I remember, I liked to play with fashion, combine colors, textures and clothing elements in an unusual way. When the chance to create a wedding dress for an exceptional person appeared in my life’s path, I could not imagine any other dress than such an unusual, wild, carefree, soft, comfortable wedding dress in the boho style! What has certainly remained unchanged since the creation of this first dress, is the fact that the most important is comfort of the bride, and that she would feel special in her dress… After all, it is not the wedding dress that should look beautiful only you in her! If someone asked me now what distinguishes my dresses from those offered by almost every wedding dress salon in Poland, I would certainly say that their softness, lightness and above all how they are fitted to the clients’ needs. Many times I met with disappointment of women, who visited the wedding dresses salon in search of a dress perfect for them and despite the huge choice on hangers; the model that was offered to them completely did not fit them. I can hear from them “I don’t fit the lace wedding dress”, and in the meantime it turns out that it’s just a matter of wrong pattern or cut. That is why the basis for my client’s satisfaction is objective stylistic advice. I want you to learn about your advantages and disadvantages, learn about yourself anew, because we often do not know how many advantages we have, and how easy it is to hide our complexes. While trying different styles of dresses I show you how they affect your silhouette and your overall image. How your proportions and character change when your body is covered with a modest wedding dress with a chiffon bottom and after it a richly decorated wedding dress with a trainer jumps onto your body. Thanks to that we choose together the best solution for you, one that will make your partner speechless. This is what distinguishes not only my dresses, but the whole related service. When I designed the first wedding dress I wanted to create a unique wedding dress – feminine, elegant and at the same time casual, a bit wild and fitting to the bride’s character. Boho style and rustic, drawing on nature and rural character seemed to be an ideal source of endless inspiration. From various fragments of clothing, rags, lace ribbons I had sewn a dress, which delighted the crowds of Instagram users. It turned out that women who are looking for a wedding dress other than a princess are many and that they all have this problem – they cannot find a dress of their dreams. Boho style turned out to be an ideal solution for most of these ladies. It combines different styles, shades and textures of materials. Everyone is able to find something for themselves in it. I love when properly selected accessories such as tassels, frills and ribbons model the silhouette. This is how Boho Dresses were created. Boho Dresses is a studio where I create unique, custom-made wedding dresses. This is a wedding dress salon, where you will find ready-made wedding dresses from the collection, or on the basis of patterns you will compose your own dream wedding dress, fitted to you. You can create your perfect set by selecting the top and bottom of dress according to your preference. It is also possible to create your dream wedding dress from scratch based on my or your inspiration. Together we will design the perfect wedding dress for you! Most importantly, the process of sewing a wedding dress will last from one to two days. If you want to experience a wonderful adventure of creating together, I invite you to Marta Trojanowska’s studio and wedding dresses salon. Just take a day to enjoy a wedding dress exactly the way you dreamed of. Do you want to sew a wedding dress with me? If you like my offer, before asking a question, please go to “FAQ” tab and read all answers to the most frequently asked questions and the most important information related to the process of designing a custom-made wedding dress, choosing ready designs from the collection of wedding dresses, as well as sewing and ordering an individual wedding dress! We are not a traditional wedding dress salon, where you choose a ready-made model and wait half a year for it, coming every now and then for fitting. We sew wedding dresses in one or two days in the presence of future Bride. We realize that this is unusual on the market, so we know that you can be worried whether the quality will be satisfactory or whether it will really be possible to sew a wedding dress in one day. On “FAQ” tab we want to dispel your doubts. See how my wedding dresses look like on me – “Individual” site, models in professional photo sessions – “Lookbook” or on the bride – “My clients”, some of which shared with me photos from their most important day in life. Every day I sew wedding dresses for clients and I make every effort to make each of dresses that we will create together to be the most beautiful wedding dress. If you asked me a few years ago if I was planning to join the wedding industry in the future, I would say “absolutely no”. I never thought that my professional life would go in this direction and I would start making wedding dresses. I’ve been involved in creative creation for many years, but I preferred to stay away from the wedding industry. As you can see, it has changed 😊 Read more about my beginnings in wedding fashion in “About me” tab. I don’t like to stick to the usual patterns, I always liked the original things and I wanted to stand out in style. I was looking for my clothes niche, and when it started to fill up and everyone wore what I was wearing, I was looking again for something that would inspire me. The same happened with weddings – I had to find my niche here. I wanted to establish the wedding dresses salon, which will be a unique proposal on the wedding market. That’s how I created a place to save women time, where I create boho wedding dresses. This innovative concept makes the process of searching for and buying a wedding dress a pleasure and not another reason for stress. What do I use for my wedding dresses? My favorite material is lace – they are very flexible and beautiful. I especially like to choose those that look like taken out of a grandmother’s wardrobe. They decorate the most beautiful wedding dresses available in my collections. They emphasize the waist and back, model the breasts and decorate the neckline. I just love to sew lace wedding dresses! Of course, apart from lace, I use many other materials, and their common denominator is softness and low susceptibility to crumpling. Thanks to this you can be sure that on the Wedding Day you will feel comfortable all day long. In my creations you can move and dance freely, which is not always obvious in case of wedding dresses! What is the process of sewing my wedding dresses in Warsaw? I wouldn’t be me if I hadn’t found a solution other than all of them, so I decided that in my wedding dresses salon creations would be created in one day – maximum two, if the project is very demanding. Probably you think it’s impossible, because in other places the sewing process takes at least a few months. In the pioneering Boho Dresses studio, creations are made in an extremely short time. No endless ties and time-bound corrections. Regardless of whether you choose an individual dress or a collection, I sew it together with you and on you. My wedding dresses salon is a place where you can openly talk of what you want. I’d love to listen to what kind of cut you dream of, what colors you like, what you would like to expose or hide, to finally gather all your expectations into one, unique wedding dress. A visit to my studio is first of all an incredible adventure, during which your wedding outfit will be created. Throughout the process, based on my many years of experience in sewing and styling, I give advice on texture, design and styling. My work represents an innovative approach to wedding fashion, and its effects can be seen by viewing the photos presenting dresses on the website.